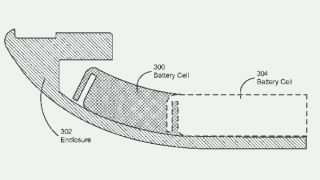 Apple's latest patent win details a curved battery cell which could make an appearance in its long-fabled iWatch. Rumours that Apple is working on a smartwatch have been flying thick and fast, and while there's no official word from the company, a curved battery cell sure seems like a sensible thing to use in a gadget that curves around a person's wrist. Of course, there are alternatives to an Apple Watch - a flexi-screened iPhone 6 or a bendable iPad perhaps - although these seem a little more outlandish. The filing, which Apple submitted in January and won this week, is for an interlocking battery cell that is manufactured in a curved shape, with the filing adding that it could curve at both ends. It is intended for "portable electronic devices" - specifically, this design is meant for "the portable electronic device that is outside of a rectangular spaces". The filing oges on to namecheck laptops, tablets, mobile phones, PDAs, digital cameras, media players, "and/or other type of battery-powered electronic devices". "The battery cell includes a set of layers including a cathode with an active coating, a separator and an anode with an active coating," the filing explains for the battery fans among us. "The battery cell also includes a pouch enclosing the layers, wherein the pouch is flexible. The layers may be wound to create a jelly roll prior to sealing the layers in the flexible pouch." Mmm, jelly roll. It's all to "facilitate efficient use of space" in whatever gadget Apple goes for, the filing notes - but there's no guarantee that Cupertino will see fit to even use the tech it's patented. So probably not worth putting money on the iWatch just yet.